I once swore I'd never have lawyers on here - that was until my old pal George Kimball decided to write his first book, which deserves a plug. George is unique - he's an outsourcing contracting lawyer with whom you'd actually enjoy a pint or two, and always has the uncanny knack of adding an air of practicality to the most stressful and dicey of situations. However, it may be the three daughters currently running (not ruining) his life that help him deal so calmly with the rigors of negotiating some of today's toughest outsourcing contracts. George has become one of the best known lawyers in the industry over recent years, representing both buyers and service providers on some of the largest and most pivotal engagements during his tenure at law-firm Baker & McKenzie, before recently joining the legal team at Hewlett-Packard (so read that small-print carefully next time you buy a printer). Thanks, Phil, for the kind invitation to offer a little advice – “over a pint.” Here are a few suggestions for buyers of outsourced services – especially first time buyers. Get good advice. Unless you have done this before, repeatedly and successfully, seek outside advice; but don't just “turn it over to the experts.” No outside advisor can know your business as well as you do. You (and not the advisors) must live with the results. Proven methods, processes and forms have great value, but can be tailored to suit situations. One size does not fit all. Look for consultants and lawyers capable of thinking creatively, and willing to vary familiar forms and methods. Focus on essentials. Details matter, but spend time and attention where it matters most: on scope, performance standards, pricing and adjustments, transitions, people, governance. “Worst case” scenarios and remedies matter, and must be provided for, but should not lionize attention. Seek long term results, rather than short term advantage. Today, there are great pressures to complete deals quickly, in order to reduce transaction costs and accelerate savings, but there was great wisdom in legendary UCLA basketball coach John Wooden's maxim: “be quick – don't hurry.” Err in haste, repent at leisure. Take sufficient time to get things right the first time. Keep it simple, or at any rate, as simple as reasonably possible. Outsourcing is complicated. There are lots of moving parts – technologies, people, locations and much else. No one should expect to crowd everything on the back of an envelope. Still, contracts need not be as thick as telephone directories, or as inscrutable as hieroglyphics. Lawyers anxious to protect their clients tend to write rules for all eventualities – forgetting sometimes that life largely consists of surprises, and that few things ever happen quite as anticipated. Issues arise inconveniently and unexpectedly. When they do, good processes may be more useful than rule books. Seek clarity, simplicity, and ease of administration. Service levels matter, but do not equal or assure quality. Service levels are a useful management tool, but easily overrated. Suppliers are rational business people. They never sign up for service levels that they cannot consistently meet or exceed, so credit dollars (“penalties”) are rarely paid (and for that matter, no one on either side ever wants to pay or receive them). Service levels are to success as vital signs are to health – necessary, but not sufficient. Customary measures such as system availability or response time are useful, but consider developing metrics for systems and processes that benefit the business. Users may not notice modest differences in usual metrics – a few tenths of percentage point here, a few seconds there. They do notice shipments, deliveries, payments, production and collections. Consider metrics that measure them. Prepare to manage the contract and relationship. Weak governance – too few people, without sufficient clout, and accustomed to managing operations, rather than relationships – remain the single most common, avoidable error among customers. Begin building a team long before any contract is signed, and involve that team in making the deal. Build strong organizational consensus behind outsourcing. It is challenging enough when all sing from the same hymnal. When business units and headquarters have different agendas, failure is likely. No one will agree, except that it was a bad idea, whose sponsors should be hanged or at least put out to grass. Risks have to be managed. This seems obvious, like the truism that contracts allocate risks. Despite the usual effort to shift risks in negotiations, both sides know (deep down inside) that risks can never be reduced to zero, or transferred entirely to the other side. Therefore, build good risk management – regulatory compliance, security, privacy, disaster recovery, and others – into the contract, and especially oversight and governance. Remember also that these same risks exist with internal operations, before outsourcing. Outsourcing may or may not increase those risks (although transferring operations outside or offshore may mean additional points of failure and different perceptions of risk). Remember why contracts work. Contracts are more than armories of rights and remedies. Termination rights and the rest have their place, and may matter in some (let us hope) unlikely situations; but companies perform contracts for the same reason that nations observe treaties: because it is in their interests to do so. Good contracts motivate parties to perform through a reasonable equilibrium in the allocation of risks, responsibilities and incentives. Performance yields benefits – savings and service for customers; margins, opportunities and references for suppliers. Failures to perform have consequences sufficient to help keep everyone on the straight and narrow. Motivation matters, but fear alone can rarely motivate excellence. Outsourcing works best when both parties succeed. The customer receives good service for a fair price and saves money. The supplier makes respectable returns from good performance, with reasonable prospects for renewal, additional opportunities and good references. Unless both parties succeed, neither is likely to do so. Propose reasonable terms. On both sides, too many start with “tough” terms – the sort that no one in his or her right mind would dream of accepting. Why bother? The unsophisticated or naive customers will be very cross when they figure it out (as they will, eventually). Suppliers are unlikely to sign harsh contracts unless they are desperate or inept. Time wasted crab-walking toward sensible middle ground is better spent on those important issues, or planning the transition. No one's allegedly “standard” forms necessarily came down the mountain with Moses and his tablets. Start with something sensible, and remember the wisdom in the Golden Rule: do not unto others as you would not be done unto (especially when you have to live with them afterward). Tone matters more than people suspect. Collaboration requires good working relationships built on candor, civility and trust. At the negotiating table, people are more willing to make concessions to others they like, respect and trust, than when they are squeezed. (If they are squeezed or bullied into something unfavorable, they will remember. If they should be fooled or misled, they will figure it out later. Depend on it.) Outsourcing is not a love feast. These are unsentimental commercial arrangements with many challenges. Even so, there are no known substitutes for clarity, courtesy, intelligence, integrity, common sense or good judgment. “Tough” methods and terms are not necessarily best. “Scorched earth” tactics singe everybody. In the long run, neither side will succeed unless both succeed. Kinder and gentler is often wiser. Simpler, reasonable documents take less time (and money) to negotiate – an added benefit. George Kimball's book (pictured right) is an accessible guide to the legal and practical issues arising from complex outsourcing deals. 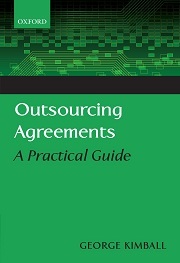 Written for non-specialist lawyers, executives and managers, the book explains the commercial, legal and contractual issues behind outsourcing. Kimball describes outsourcing as a part of a larger trend toward extended, global enterprises in a world with fewer boundaries than before. Companies outsource critical operations seeking superior performance, greater efficiency and lower cost. His book explains the competing interests of customers and suppliers, and how the contractual, financial, operational and other elements fit together into a coherent whole to deliver good results for both sides because, according to Kimball, “neither [side] will succeed unless both succeed.” Collaborative methods, he contends, yield better outcomes, while saving time and money in negotiations. 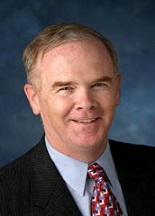 George Kimball is an attorney and long-time specialist in outsourcing. While in private practice, he was a member of Baker & McKenzie’s respected technology, outsourcing and communications practice, and ranked as a leader in his field by Chambers and Partners and Legal 500. He is a graduate of UCLA, University College London and the University of Michigan Law School with more than 30 years of legal experience. Excellent guide. The resource pool one is drawing from is a major factor to consider. Sometimes the temptation to chase savings is so great that these other check list items are ignored. Today, it's possible to move further along the value chain toward actual legal support that' handled by bar-admitted American lawyers living elsewhere, primarily in Israel. This model of outsourcing makes location incidental - the credentials are identical to those one might find onshore but at about 1/2 the cost, which is very different than the traditional "offshoring" arrangement. This is outstanding advice - a great collection of thoughts from someone who clearly has lived through outsourcing contracting many many times. Great piece! I've been in outsourcing as both a supplier and advisor for the past 25 years, and wish that all sides would take these instructions to heart. The truly successful, long-term outsourcing relationships that I've seen and helped craft followed this guidance. Most of the ones I've helped unwind did not. Be reasonable, don't try to "outsmart" the other side, and focus on the things that are truly important for the success of your business (e.g., fewer, more meaningful SLA's will bring a better outcome than dozens of SLA's measuring things that ultimately don't drive the busines). Terriffic to hear a lawyer suggest not spending too much time on what happens in a relationship meltdown. The most painful contracts I ever negotiated were the ones where an attourney decided that failure was a foregone conclusion, and all things lead to armageddon and termination......NOT the way to start relationship. Great article and good advice. Definitely worth a read if you are considering outsourcing. I've had the good fortune to work with George and to observe him practice what he preaches. His advice and counsel, as it was in the past, is more critical in today's outsourcing practice than ever. His focus on big picture, business-oriented outcomes, combined with a wry sense of humor and collaborative negotiation style, makes George the consummate professional, and I look forward to reading his book.